Iowa Stadium was constructed in only seven months between 1928 and 1929. Groundbreaking and construction began on March 6, 1929. Workers worked around the clock using lights by night and horses and mules as the primary heavy-equipment movers. There was a rumor for many years that horses that died during the process were buried under what now is the North end zone. Historians report this is a myth and the animals were disposed of in the nearby Iowa River. The round-the-clock construction came to an end in July. Despite several problems to overcome, including the athletic director's resignation and a slight redesign, the stadium was completed and the first game was played October 5, 1929, against Monmouth College. Iowa won the game 46–0. The stadium was dedicated two weeks later, when the Hawkeyes tied Illinois 7–7. The playing surface is currently the synthetic FieldTurf (installed in 2017), although it was AstroTurf from 1972 until grass was reinstalled for the 1989 season. The installation of artificial turf came at the same time that Iowa Stadium was renamed Kinnick Stadium in honor of the Heisman winner who had perished 29 years earlier. When filled to capacity, Kinnick Stadium would be the sixth largest city in Iowa (after Des Moines, Cedar Rapids, Davenport, Sioux City, and Iowa City). Prior to the 2015 football season, the stadium did not have permanent lights; the school contracted Musco Lighting's portable light trucks for night games in previous years. The school had installed permanent practice lights at the stadium in 2012. By capacity, Kinnick Stadium is the 27th largest college football stadium, the 42nd largest sports stadium in the United States, and the 86th largest sports stadium in the world. On November 14, 2015, Iowa set the national collegiate wrestling dual-meet attendance record at Kinnick with over 42,000 fans in a victory over #1 Oklahoma State. Kinnick Stadium is well known for its pink visitors' locker rooms, a tradition started by emeritus Iowa coach Hayden Fry. Believing that pink would put opponents in a "passive mood", and because he thought that some believed pink was a "sissy color", Fry had the visiting locker rooms decorated completely in the color pink. One thing we didn't paint black and gold was the stadium's visitors locker room, which we painted pink. It's a passive color, and we hoped it would put our opponents in a passive mood. Also, pink is often found in girls' bedrooms, and because of that some consider it a sissy color. The pink locker room tradition has been continued with the newly renovated locker rooms, which include everything from pink urinals to pink lockers. Controversy flared during the 2005 season when a visiting law professor, along with other university faculty and students protested the pink coloration as demeaning to women and homosexuals. Despite these protests and with lots of student support, however, the locker room remains pink. A more recent feature is the 20-foot-tall (6.1 m) bronze statue of Heisman Trophy winner Nile Kinnick, the statue depicts Kinnick dressed as a scholar, rather than in his football uniform. The bronze statue is placed near the team entrance to the stadium. When the renovation of the stadium was completed, and the statue unveiled, a tradition among the players began: one player, before entering the locker room, reached out and touched the helmet that was placed at Kinnick's feet. From that point on, all Iowa players, before entering the locker room, and after getting off the bus, walk up to the statue and rub the helmet, as a token of respect for Kinnick - the only Iowa player to ever win the Heisman Trophy. The on-field entrances to the stadium all have one thing in common, a picture of Nile Kinnick is placed above the tunnel before exiting the tunnel to the field. After 75 years of operation, the Iowa Board of Regents endorsed a major renovation of Kinnick Stadium on March 10, 2004. The US$86.8 million project was to build a new state of the art press box, a new scoreboard with a new sound system, replace the "temporary" south endzone bleachers with permanent seating, triple the restroom facilities, and more than double the number of concession stands, as well as smaller changes such as new locker rooms, a bronze statue of Nile Kinnick and the dedication of the Krause Family Plaza to which Kinnick Stadium is now adjacent. Every brick for the renovation came from the Glen-Gery Brickyard in Redfield, which is located near Nile Kinnick's childhood home in Adel. The stadium was rededicated on September 1, 2006. Among other things, the rededication featured a flyover by a F4F Wildcat, the aircraft that Kinnick flew in World War II. The stadium also underwent major renovations in 1956, 1983, and 1990 where capacity was gradually taken from 53,000 to 70,397. The 2004–06 renovations pushed the capacity to 70,585. In the spring of 2009, the natural grass turf and 20-year-old drainage system were replaced with a new state-of-the-art synthetic FieldTurf playing surface. In 2013, the Iowa Board of Regents approved an $8 million upgrade of Kinnick Stadium's video and sound systems. These upgrades include the installation of new HD video displays in both the north and south endzones, as well as a new HD ribbon display above the north endzone. The upgrades were completed by the start of the 2013 football season. In 2016, the Iowa Board of Regents approved an $89.9 million upgrade to Kinnick Stadium's north end zone. The proposed renovation features the addition of box seating, outdoor club seating and a scoreboard larger than the board in the south end zone. All seating will be ready for the 2018 football season while the rest of the project is scheduled to be completed by the start of the 2019 football season. The Hawkeye Express train transports spectators to Kinnick Stadium from Coralville on game day. The University of Iowa Children's Hospital's new building overlooks the East stands of Kinnick Stadium. The opening of the new hospital in 2017 led to the creation of what ESPN called "college football's coolest new tradition." The new facility includes a top-floor lounge area known as the Press Box Cafe that has a view of the entire field, allowing patients and their families to see all Iowa home games live, and also includes big-screen TVs to allow them to watch Hawkeyes road games. A suggestion on a Hawkeyes fan page on Facebook led to "The Wave"—at the end of the first quarter of Iowa home games, the crowd faces the hospital and waves at the patients and their families watching in the Press Box. For the Hawkeyes' first night home game of the 2017 season against Penn State, the fan site where the idea of "The Wave" originated encouraged fans to turn on their cell phone flashlights while they waved to the patients. Ever since the humble beginnings of the “The Kinnick Wave”, even players on both teams and the on-field game officials join in this heartwarming tradition now. Since 2008, Iowa is 4-1 against AP Top 5 opponents in Kinnick Stadium. In 2008, an unranked Iowa beat 3rd ranked Penn State on kicker Daniel Murray’s walk off field goal. The game-winning field goal capped an Iowa comeback in a game that Penn State led 23-14 with 9:21 remaining in the 4th quarter. In 2010, 5th ranked Michigan State visited Kinnick Stadium looking to continue their undefeated season. The 18th ranked Hawkeyes would beat the Spartans by a final score of 37-6, in a game that Iowa led 30-0 at halftime. The Spartans would not put any points on the scoreboard until the 4th quarter. In 2015, fans in Kinnick Stadium got to witness Iowa's most successful regular season in school history. The Hawkeyes went 12-0 and won the Big Ten West Division. After a loss in the Big Ten Championship Game to Michigan State, the Hawkeyes received a bid to the Rose Bowl, its first New Year's Six bowl invitation since the start of the College Football Playoff system. In 2016, 3rd ranked Michigan was knocked off by an unranked Iowa by a score of 14-13, with kicker Keith Duncan’s walk off game-winning field goal. The game was televised on ABC Saturday Night Football. In 2017, an unranked and 20 point underdog Iowa knocked off the 3rd ranked Ohio State Buckeyes by a score of 55-24. Earlier in 2017, it took a touchdown on 4th down on the last play of the game for the 3rd ranked Penn State Nittany Lions to beat the unranked Hawkeyes 21-19. The game was televised on ABC Saturday Night Football. Relief of Nile Kinnick's famous touchdown against the University of Notre Dame in south end of the stadium. ^ Morehouse, Marc (July 25, 2018). "Iowa AD Gary Barta Moves From 'No' to 'If' on Alcohol Sales in Kinnick Stadium". The Gazette (Cedar Rapids). Retrieved July 25, 2018. ^ a b Turnbull, Buck. Stadium Stories: Iowa Hawkeyes. Guilford, Connecticut: Morris Book Publishing, LLC. p. 42. ISBN 0-7627-3819-7. ^ "Kinnick Stadium". Ballparks.com. 2005. Retrieved July 25, 2007. 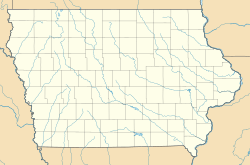 ^ "Iowa Cities by Population". Iowa-Demographics. May 2018. Retrieved June 20, 2018. ^ Carlson, Mark (September 1, 2015). "Permanent Lights at Kinnick Stadium Could Mean More Evening Events". The Gazette (Cedar Rapids). Retrieved April 1, 2018. ^ "Kinnick Stadium". The University of Iowa Athletics. June 13, 2016. Retrieved April 1, 2018. ^ "Iowa Football Practicing Around Construction". The University of Iowa Athletics. April 2, 2012. Retrieved April 1, 2018. ^ Keeler, Sean (August 21, 2005). "Hayden Lives On: Visitors' Quarters Still Pretty in Pink". The Des Moines Register. Retrieved June 6, 2012. ^ Fry, Hayden; Wine, George (1999). Hayden Fry: A High Porch Picnic. Sports Publishing LLC. p. 102. ISBN 1-58261-033-9. ^ "Opponents Seeing Red Over Iowa's Pink Locker Room". MSNBC. Associated press. September 28, 2005. ^ Curtis, Christopher (September 28, 2005). "Iowa Pink Visitors' Locker Room Under Fire". gay.com. Archived from the original on April 28, 2006. ^ Buzuvis, Erin (2007). "Reading The Pink Locker Room: On Football Culture And Title IX". William & Mary Journal of Women and the Law. 14 (1): 2. ^ Iowa Hawkeyes Roost in Historic Rebuilt Stadium (PDF). 2006. ^ Smith, Ian (August 30, 2006). "Kinnick Set to Reopen". The Daily Iowan. Archived from the original on March 5, 2008. Retrieved March 5, 2008. ^ Morehouse, Marc (April 25, 2013). "Regents Approve Kinnick Video, Sound Upgrade". The Gazette (Cedar Rapids). Retrieved April 1, 2018. ^ "UI Receives Approval for Kinnick Stadium Renovation". The University of Iowa Athletics. October 20, 2016. Retrieved October 31, 2016. ^ Sherman, Mitch (September 18, 2017). "Inside college football's coolest new tradition: Iowa's hospital wave". ESPN.com. Retrieved September 23, 2017. ^ Saunders, Forrest (September 22, 2017). "Meet the woman who helped make 'The Wave' happen". Cedar Rapids, Iowa: KCRG-TV. Retrieved September 23, 2017.